It's great you can follow along in a pdf so you can not only see the word but hear its' pronunciations. It has plenty of content and what seemed to be mini questions as well to quiz the reader. 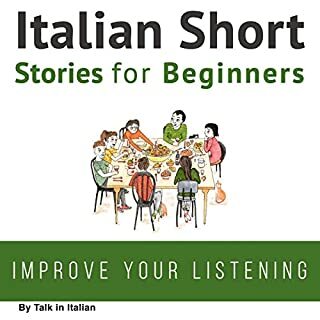 It's really a great resource for anyone at any non native level of italian language acquisition. You hear two different voices and so much from seeing example sentences and applications of it. It's a brush up on vocab for more advanced speakers, and cements sentence structure for beginners as well as vocab. The mini quiz secetions are great for comprehension and I appreciate their inclusion. Which character – as performed by Eddie Pez and Jessica Muraca – was your favorite? The pronunciation and listening component. It's one thing to read a language and another thing to hear it. No, it's more of a section at a time book. It's a learning supplement and not a novel. Excellent job! Come out with one in german please!